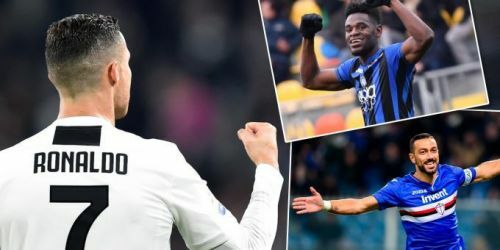 As Juventus continue to extend their lead at the summit of the Serie A, the big hitters continued their prolific scoring run as Cristiano Ronaldo once more found the back of the net for the Old Lady in a convincing win over 19th placed Frosinone. The likes of Ciro Immobile and the ageless Fabio Quagliarella failed to score as both Lazio and Sampdoria lost on Matchday 24. The Biancoceleste are now four points behind AC Milan who occupy the last remaining slot for champions league qualification in the league table. Gennaro Gattuso's Milan has found some form thanks to their January signing Krzysztof Piatek who seems at home in Rossoneri colors. There were goals galore in Bergamo yet again, but this time it was Atalanta who fell victim to an inspired Milan. Duvan Zapata who is a man on a mission in Serie A, surprisingly failed to score as AC Milan ran out comfortable 3-1 winners. Napoli's top scorer Arkadiusz Milik was restored to the starting line-up but failed to add to his goal tally of 12 goals during the weekend as his side were held to a frustrating goalless draw by Torino at home. That result jeopardized significantly Napoli's chances of chasing Juventus at the top of the league table as the Old Lady are now 13 points clear after their 3-0 win over Frosinone. Worryingly for Napoli fans, they have failed to score in three of their last four matches.